[Updated to Reveal Phase Two of Trial and Jury Award] Moments ago, a federal jury in San Francisco, California ruled against Bayer Monsanto in a cancer lawsuit involving the popular Roundup weed killer product. A jury of five men and one woman concluded that Roundup was a substantial factor in causing the cancer of Ed Hardeman. Hardeman later developed large B-cell Non-Hodgkin Lymphoma and blamed Roundup for his cancer. Approximately 11,000 cancer patients or the families of deceased cancer patients have filed lawsuits against Monsanto and its parent Bayer. Monsanto is the company that developed Roundup and other weedkillers that use a chemical called glyphosate to kill weeds. Because there are so many lawsuits claiming that Roundup caused cancer, the federal courts consolidated the cases into what is called a multidistrict litigation. Hardeman’s trial is one of a handful of cases that will be tried over the next year. In a multidistrict litigation, the judge handling the cases selects a few representative cases to become “bellwether” trials. Depending on how those test cases go, often most of the remaining cases can be settled. The outcome of these test “bellwether” cases helps lawyers on both sides decide whether to continue fighting similar suits in court or seek a global resolution. Hardeman’s victory today puts the lawyers in the remaining thousands of lawsuits in a stronger position to settle their cases. Now that the two cases have gone to trial have resulted in big wins for cancer patients, Bayer Monsanto may consider a global resolution. Earlier indications are that the company intends to appeal and fight, however. Last summer, a state court jury in California awarded DeWayne “Lee” Johnson $289 million after finding Monsanto’s Rangerpro caused his cancer. Johnson was a school groundskeeper. Monsanto has appealed the verdict. Many expert witnesses testified for both sides in the trial. We were surprised, however, when one of Monsanto’s oncology doctors testified she didn’t have experience in working with herbicides. That expert, Dr Alexandra Levine, also admitted that the American Cancer Society recognizes that exposure to powerful chemicals can be a risk factor for non Hodgkin lymphoma. Monsanto’s trial team took another misstep when their lawyer allowed a Monsanto witness to testify that glyphosate was not genotoxic. Genotoxicity describes the property of chemical compounds that damages the genetic information within a cell causing mutations, which may lead to cancer. By saying glyphosate was not genotoxic, Monsanto opened the door to allow jurors to hear about an internal company report from 1999 that concluded the weedkiller’s active ingredient can cause genetic damage to human cells. During closing arguments, Hardeman claimed that his exposure to the herbicide had been extreme and that his experts had presented “overwhelming evidence” to show the risk of getting lymphoma increases the more a person uses Roundup. Monsanto criticized the Hardeman’s experts as inadequate and unreliable. The company argued that Hardeman has the most common non-Hodgkin lymphoma and ultimately it is impossible to completely rule out chronic hepatitis C and hepatitis B as a contributing factor to his cancer. Earlier today, the jury sided with Hardeman, and found his cancer was likely caused by his use of Roundup. Now jurors will have to decide how much Monsanto will have to pay in damages. [Update March 27, 2019] Hardeman’s trial against Monsanto was held in two phases. In the first phase, the jury was simply asked to determine whether Monsanto’s glyphosate based Roundup weed killer was the cause of Mr. hardeman’s cancer. After the jury said “yes,” the court held a second phase to determine damages. Today the jury awarded him $80 million. The award is much the dame as the recent $278 million award by DeWayne Johnson. Although the jury awarded $278 million, the state court judge in that action later lowered the award to $78 million. In Hardeman’s case, the jury awarded $200,967 in economic damages, $5 million in future and past noneconomic damages, and $75 million in punitive damages. During the damages phase of the trial, Hardeman presented evidence that between 1980 and 2012, Monsanto was aware of 29 epidemiological, oxidative, animal studies, three oxidative and genotoxicity studies that linked its Roundup products to cancer. Despite this overwhelming evidence, Monsanto never changed their labeling to warn consumers and refused to conduct their own research. Monsanto employees testified they regularly use the product at their own homes and without extra protection. Cancer Victim with Prior Exposure to RoundUp? If you believe you or a loved one were diagnosed with non Hodgkin lymphoma, myeloma or leukemia and were a regular user of Roundup or other glyphosate herbicides, contact us immediately. We believe there is a direct link between cancer and these products. Despite Monsanto’s claims to the contrary, many experts believe that glyphosate is carcinogenic. That means these products could kill you even if used as directed. Monsanto is liable for injuries and damages attributable to bad or unsafe products. That includes being responsible for products with improper warning labels or instructions. or by phone at 414-704-6731 (direct). Our Roundup cancer lawyers will give you a no obligation, complimentary evaluation of your case. Want to learn more before calling? Please visit our Monsanto cancer victim video and read our Roundup cancer lawsuit information page. You can find the video there. We also have a Roundup glyphosate resources page with links to many other stories. What follows below is the actual complaint filed on behalf of Edward Hardeman in San Francisco. Obviously, every case is different. If you or a loved one has cancer and you believe that cancer was caused by exposure to Roundup (glyphosate), you need legal representation. Our notes and explanations appear throughout the complaint and are marked with an asterisk (*). MONSANTO COMPANY and JOHN DOES 1-50. This is an action for damages suffered by Plaintiff as a direct and proximate result of Defendants’ negligent and wrongful conduct in connection with the design, development, manufacture, testing, packaging, promoting, marketing, advertising, distribution, labeling, and/or sale of the herbicide Roundup®, containing the active ingredient glyphosate. Plaintiff maintains that Roundup® and/or glyphosate is defective, dangerous to human health, unfit and unsuitable to be marketed and sold in commerce, and lacked proper warnings and directions as to the dangers associated with its use. Plaintiff’s injuries, like those striking thousands of similarly situated victims across the country, were avoidable. This Court has jurisdiction over Defendants and this action pursuant to 28 U.S.C. § 1332 because there is complete diversity of citizenship between Plaintiff and Defendants. Defendants are all either incorporated and/or have their principal place of business outside of the state in which the Plaintiff resides. The amount in controversy between Plaintiff and Defendants exceeds $75,000, exclusive of interest and cost. Venue is proper within this district pursuant to 28 U.S.C. § 1391 in that Defendants conduct business here and are subject to personal jurisdiction in this district. Furthermore, Defendants sell, market, and/or distribute Roundup® within the District of California. Also, a substantial part of the acts and/or omissions giving rise to these claims occurred within this district. Plaintiff, Edward Hardeman, is a natural person and at all relevant times a resident and citizen of Sonoma County, California. Plaintiff brings this action for personal injuries sustained by exposure to Roundup® (“Roundup”) containing the active ingredient glyphosate and the surfactant POEA. As a direct and proximate result of being exposed to Roundup, Plaintiff developed nonHodgkin’s Lymphoma. “Roundup” refers to all formulations of Defendants’ roundup products, including, but not limited to, Roundup Concentrate Poison Ivy and Tough Brush Killer 1, Roundup Custom Herbicide, Roundup D-Pak herbicide, Roundup Dry Concentrate, Roundup Export Herbicide, Roundup Fence & Hard Edger 1, Roundup Garden Foam Weed & Grass Killer, Roundup Grass and Weed Killer, Roundup Herbicide, Roundup Original 2k herbicide, Roundup Original II Herbicide, Roundup Pro Concentrate, Roundup Prodry Herbicide, Roundup Promax, Roundup Quik Stik Grass and Weed Killer, Roundup Quikpro Herbicide, Roundup Rainfast Concentrate Weed & Grass Killer, Roundup Rainfast Super Concentrate Weed & Grass Killer, Roundup Ready-to-Use Extended Control Weed & Grass Killer 1 Plus Weed Preventer, Roundup Ready-to-Use Weed & Grass Killer, Roundup Ready-to-Use Weed and Grass Killer 2, Roundup Ultra Dry, Roundup Ultra Herbicide, Roundup Ultramax, Roundup VM Herbicide, Roundup Weed & Grass Killer Concentrate, Roundup Weed & Grass Killer Concentrate Plus, Roundup Weed & Grass killer Ready-to-Use Plus, Roundup Weed & Grass Killer Super Concentrate, Roundup Weed & Grass Killer1 Ready-to-Use, Roundup WSD Water Soluble Dry Herbicide Deploy Dry Herbicide, or any other formulation of containing the active ingredient glyphosate. Defendant MONSANTO COMPANY is a Delaware corporation, Calif. Secretary of State Entity No. C2362863, in “active” status, with a principle place of business in St. Louis, Missouri. Upon best information and belief, Defendants JOHN DOES 1-50 are subsidiaries, partners, or other entities that were involved in the design, development, manufacture, testing, packaging, promoting, marketing, advertising, distribution, labeling, and/or sale of the herbicide Roundup, containing the active ingredient glyphosate. The identities of JOHN DOES 1-50 are unknown to Plaintiff at this time. Plaintiff will move the Court to specifically name JOHN DOES 1-50 as their identities becomes known to Plaintiff through discovery. Defendants advertise and sell goods, specifically Roundup, in Sonoma County, California. Defendants transacted and conducted business within the State of California that relates to the allegations in this Complaint. Defendants derived substantial revenue from goods and products used in the State of California. Defendants expected or should have expected their acts to have consequences within the State of California, and derived substantial revenue from interstate commerce. Defendants engaged in the business of designing, developing, manufacturing, testing, packaging, marketing, distributing, labeling, and/or selling Roundup. Defendants are authorized to do business in California and derive substantial income from doing business in this state. Upon information and belief, Defendants purposefully availed themselves of the privilege of conducting activities with the State of California, thus invoking the benefits and protections of its laws. Upon information and belief, Defendants did act together to design, sell, advertise, manufacture and/or distribute Roundup, with full knowledge of its dangerous and defective nature. At all relevant times, Defendants were in the business of, and did, design, research, manufacture, test, advertise, promote, market, sell, distribute, and/or have acquired and are responsible for Defendants who have designed, researched, manufactured, tested, advertised, promoted, marketed, sold, and distributed the commercial herbicide Roundup. Monsanto is a multinational agricultural biotechnology corporation based in St. Louis, Missouri. It is the world’s leading producer of glyphosate. Defendants discovered the herbicidal properties of glyphosate during the 1970’s and subsequently began to design, research, manufacture, sell and distribute glyphosate based “Roundup” as a broad spectrum herbicide. Glyphosate is a broad-spectrum herbicide used to kill weeds and grasses known to compete with commercial crops grown around the globe. Glyphosate is a “non-selective” herbicide, meaning it kills indiscriminately based only on whether a given organism produces a specific enzyme, 5-enolpyruvylshikimic acid-3-phosphate synthase, known as EPSP synthase. Glyphosate inhibits the enzyme 5-enolpyruvylshikimic acid-3-phosphate synthase that interferes with the shikimic pathway in plants, resulting in the accumulation of shikimic acid in plant tissue and ultimately plant death. Sprayed as a liquid, plants absorb glyphosate directly through their leaves, stems, and roots, and detectable quantities accumulate in the plant tissues. Each year, approximately 250 million pounds of glyphosate are sprayed on crops, commercial nurseries, suburban lawns, parks, and golf courses. This increase in use has been driven largely by the proliferation of genetically engineered crops, crops specifically tailored to resist the activity of glyphosate. Defendants are intimately involved in the development, design, manufacture, marketing, sale, and/or distribution of genetically modified (“GMO”) crops, many of which are marketed as being resistant to Roundup i.e., “Roundup Ready®.” As of 2009, Defendants were the world’s leading producer of seeds designed to be Roundup Ready®. In 2010, an estimated 70% of corn and cotton, and 90% of soybean fields in the United States contained Roundup Ready® seeds. The original Roundup, containing the active ingredient glyphosate, was introduced in 1974. Today, glyphosate products are among the world’s most widely used herbicides. Monsanto’s glyphosate products are registered in more than 130 countries and are approved for weed control in more than 100 crops. No other herbicide active ingredient compares in terms of number of approved uses. For nearly 40 years, farmers across the globe have used Roundup, unaware of its carcinogenic properties. 33.The manufacture, formulation and distribution of herbicides, such as Roundup, is regulated under the Federal Insecticide, Fungicide and Rodentcide Act (“FIFRA”), 7 U.S.C. §136 et seq. FIFRA requires that all pesticides be registered with the Environmental Protection Agency (“EPA”) prior to their distribution, sale, or use, except as described by FIFRA 7 U.S.C. 136a(a). The EPA requires as part of the registration process, among other requirements, a variety of tests to evaluate the potential for exposure to pesticides, toxicity to people and other potential nontarget organisms, and other adverse effects on the environment. Registration by the EPA, however, is not an assurance or finding of safety. The determination the EPA makes in registering or re-registering a product is not that the product is “safe,” but rather that use of the product in accordance with its label directions “will not generally cause unreasonable adverse effects on the environment.” 7 U.S.C. § 136(a)(c)(5)(D). FIFRA defines “unreasonable adverse effects on the environment” to mean “any unreasonable risk to man or the environment, taking into account the economic, social, and environmental costs and benefits of the use of any pesticide.” 7 U.S.C. § 136(bb). FIFRA thus requires the EPA to make a risk/benefit analysis in determining whether a registration should be granted or allowed to continue to be sold in commerce. The EPA and the State of California registered Roundup for distribution, sale, and manufacture in the United States and the State of California. FIFRA generally requires that the registrant, Monsanto, conduct health and safety testing of pesticide products. The government is not required, nor is it able, to perform the product tests that are required of the manufacturer. The evaluation of each pesticide product distributed, sold, or manufactured is completed at the time the product is initially registered. The data necessary for registration of a pesticide has changed over time. The EPA is now in the process of re-evaluating all pesticide products through a Congressionally-mandated process called “re-registration.” 7 U.S.C. § 136a-1. In order to reevaluate these pesticides, the EPA demands the completion of additional tests and the submission of data for the EPA’s review and evaluation. In the case of glyphosate and Roundup, the EPA had planned on releasing its preliminary risk assessment – in relation to the registration process – no later than July 2015. The EPA completed its review of glyphosate in early 2015, but delayed releasing the assessment pending further review in light of the World Health Organization’s findings. e) This non-residual herbicide will not wash or leach in the soil. It … stays where you apply it. f) You can apply Accord with “confidence because it will stay where you put it” it bonds tightly to soil particles, preventing leaching. Then, soon after application, soil microorganisms biodegrade Accord into natural products. g) Glyphosate is less toxic to rats than table salt following acute oral ingestion. i) You can feel good about using herbicides by Monsanto. They carry a toxicity category rating of ‘practically non-toxic’ as it pertains to mammals, birds and fish. j) “Roundup can be used where kids and pets will play and breaks down into natural material.” This ad depicts a person with his head in the ground and a pet dog standing in an area which has been treated with Roundup. a) its glyphosate-containing pesticide products or any component thereof are safe, non-toxic, harmless or free from risk. f) its glyphosate-containing products or any component thereof might be classified as “practically non-toxic. Monsanto did not alter its advertising in the same manner in any state other than New York, and on information and belief still has not done so today. As early as the 1980’s Monsanto was aware of glyphosate’s carcinogenic properties. On March 4, 1985, a group of the Environmental Protection Agency’s (“EPA”) Toxicology Branch published a memorandum classifying glyphosate as a Category C oncogene. Category C oncogenes are possible human carcinogens with limited evidence of carcinogenicity. In 1986, the EPA issued a Registration Standard for glyphosate (NTIS PB87-103214). The Registration standard required additional phytotoxicity, environmental fate, toxicology, product chemistry, and residue chemistry studies. All of the data required was submitted and reviewed and/or waived. In October 1991 the EPA published a Memorandum entitled “Second Peer Review of Glyphosate.” The memorandum changed glyphosate’s classification to Group E (evidence of noncarcinogenicity for humans). Two peer review committee members did not concur with the conclusions of the committee and one member refused to sign. In addition to the toxicity of the active molecule, many studies support the hypothesis that glyphosate formulations found in Defendants’ Roundup products are more dangerous and toxic than glyphosate alone. As early as 1991 evidence existed demonstrating that glyphosate formulations were significantly more toxic than glyphosate alone. The study found that Defendants’ Roundup caused delays in the cell cycles of sea urchins, while the same concentrations of glyphosate alone proved ineffective and did not alter cell cycles. In 2004, Julie Marc published a study entitled “Glyphosate-based pesticides affect cell cycle regulation.” The study demonstrated a molecular link between glyphosate-based products and cell cycle dysregulation. In 2005, Francisco Peixoto published a study showing that Roundup’s effects on rat liver mitochondria are much more toxic and harmful than the same concentrations of glyphosate alone. The Peixoto study suggested that the harmful effects of Roundup on mitochondrial bioenergetics could not be exclusively attributed to glyphosate and could be the result of other chemicals, namely the surfactant POEA, or alternatively due to the possible synergy between glyphosate and Roundup formulation products. In 2009, Nora Benachour and Gilles-Eric Seralini published a study examining the effects of Roundup and glyphosate on human umbilical, embryonic, and placental cells. The study used dilution levels of Roundup and glyphosate far below agricultural recommendations, corresponding with low levels of residues in food. The study concluded that supposed “inert” ingredients, and possibly POEA, change human cell permeability and amplify toxicity of glyphosate alone. The study further suggested that determinations of glyphosate toxicity should take into account the presence of adjuvants, or those chemicals used in the formulation of the complete pesticide. The study confirmed that the adjuvants in Roundup are not inert and that Roundup is always more toxic than its active ingredient glyphosate. The results of these studies were confirmed in recently published peer-reviewed studies and were at all times available and/or known to Defendants. Defendants knew or should have known that Roundup is more toxic than glyphosate alone and that safety studies on Roundup, Roundup’s adjuvants and “inert” ingredients, and/or the surfactant POEA were necessary to protect Plaintiff from Roundup. Defendants knew or should have known that tests limited to Roundup’s active ingredient glyphosate were insufficient to prove the safety of Roundup. Defendants failed to appropriately and adequately test Roundup, Roundup’s adjuvants and “inert” ingredients, and/or the surfactant POEA to protect Plaintiff from Roundup. Rather than performing appropriate tests, Defendants relied upon flawed industry supported studies designed to protect Defendants’ economic interests rather than Plaintiff and the consuming public. Despite their knowledge that Roundup was considerably more dangerous than glyphosate alone, Defendants continued to promote Roundup as safe. The International Agency for Research on Cancer (“IARC”) is the specialized intergovernmental cancer agency the World Health Organization (“WHO”) of the United Nations tasked with conducting and coordinating research into the causes of cancer. An IARC Advisory Group to Recommend Priorities for IARC Monographs during 2015– 2019 met in April 2014. Though nominations for the review were solicited, a substance must meet two criteria to be eligible for review by the IARC Monographs: there must already be some evidence of carcinogenicity of the substance, and there must be evidence that humans are exposed to the substance. IARC set glyphosate for review in 2015-2016. IARC uses five criteria for determining priority in reviewing chemicals. The substance must have a potential for direct impact on public health; scientific literature to support suspicion of carcinogenicity; evidence of significant human exposure; high public interest and/or potential to bring clarity to a controversial area and/or reduce public anxiety or concern; related agents similar to one given high priority by the above considerations. Data reviewed is sourced preferably from publicly accessible, peer-reviewed data. On March 24, 2015, after its cumulative review of human, animal, and DNA studies for more than one (1) year, many of which have been in Defendants’ possession since as early as 1985, the IARC’s working group published its conclusion that the glyphosate contained in Defendants’ Roundup herbicide, is a Class 2A “probable carcinogen” as demonstrated by the mechanistic evidence of carcinogenicity in humans and sufficient evidence of carcinogenicity in animals. The IARC’s full Monograph was published on July 29, 2015 and established glyphosate as a class 2A probable carcinogen to humans. According to the authors glyphosate demonstrated sufficient mechanistic evidence (genotoxicity and oxidative stress) to warrant a 2A classification based on evidence of carcinogenicity in humans and animals. The IARC Working Group found an increased risk between exposure to glyphosate and non-Hodgkin’s lymphoma (“NHL”) and several subtypes of NHL, and the increased risk continued after adjustment for other pesticides. The IARC also found that glyphosate caused DNA and chromosomal damage in human cells. Despite the new classification by the IARC, Defendants have had ample evidence of glyphosate and Roundup’s genotoxic properties for decades. Genotoxicity refers to chemical agents that are capable of damaging the DNA within a cell through genetic mutations, which is a process that is believed to lead to cancer. The study found that tadpoles exposed to Roundup showed significant DNA damage when compared with unexposed control animals. Both human and animal studies have shown that glyphosate and glyphosate-based formulations such as Roundup can induce oxidative stress. Oxidative stress and associated chronic inflammation are believed to be involved in carcinogenesis. In 2006 César Paz-y-Miño published a study examining DNA damage in human subjects exposed to glyphosate. The study produced evidence of chromosomal damage in blood cells showing significantly greater damage after exposure to glyphosate than before in the same individuals, suggesting that the glyphosate formulation used during aerial spraying had a genotoxic effect on exposed individuals. Despite knowledge to the contrary, Defendants maintain that there is no evidence that Roundup is genotoxic, that regulatory authorities and independent experts are in agreement that Roundup is not genotoxic, and that there is no evidence that Roundup is genotoxic. In addition to glyphosate and Roundup’s genotoxic properties, Defendants have long been aware of glyphosate’s carcinogenic properties. Glyphosate and Roundup in particular have long been associated with carcinogenicity and the development of numerous forms of cancer, including, but not limited to, non-Hodgkin’s lymphoma, Hodgkin’s lymphoma, multiple myeloma, and soft tissue sarcoma. Defendants have known of this association since the early to mid-1980s and numerous human and animal studies have evidenced the carcinogenicity of glyphosate and/or Roundup. In 1985 the EPA studied the effects of glyphosate in mice finding a dose related response in male mice linked to renal tubal adenomas, a rare tumor. The study concluded the glyphosate was oncogenic. In 2003 Lennart Hardell and Mikael Eriksson published the results of two case controlled studies on pesticides as a risk factor for NHL and hairy cell leukemia. The study concluded that glyphosate had the most significant relationship to NHL among all herbicides studies with an increased odds ratio of 3.11. In 2003 AJ De Roos published a study examining the pooled data of mid-western farmers, examining pesticides and herbicides as risk factors for NHL. The study, which controlled for potential confounders, found a relationship between increased NHL incidence and glyphosate. In 2008 Mikael Eriksson published a study a population based case-control study of exposure to various pesticides as a risk factor for NHL. This strengthened previous associations between glyphosate and NHL. In spite of this knowledge, Defendants continued to issue broad and sweeping statements suggesting that Roundup was, and is, safer than ordinary household items such as table salt, despite a lack of scientific support for the accuracy and validity of these statements and, in fact, voluminous evidence to the contrary. Upon information and belief, these statements and representations have been made with the intent of inducing Plaintiff, the agricultural community, and the public at large to purchase, and increase the use of, Defendants’ Roundup for Defendants’ pecuniary gain, and in fact did induce Plaintiff to use Roundup. Defendants made these statements with complete disregard and reckless indifference to the safety of Plaintiff and the general public. Notwithstanding Defendants’ representations, scientific evidence has established a clear association between glyphosate and genotoxicity, inflammation, and an increased risk of many cancers, including, but not limited to, NHL, Multiple Myeloma, and soft tissue sarcoma. Defendants knew or should have known that glyphosate is associated with an increased risk of developing cancer, including, but not limited to, NHL, Multiple Myeloma, and soft tissue sarcomas. Defendants failed to appropriately and adequately inform and warn Plaintiff of the serious and dangerous risks associated with the use of and exposure to glyphosate and/or Roundup, including, but not limited to, the risk of developing NHL, as well as other severe and personal injuries, which are permanent and/or long-lasting in nature, cause significant physical pain and mental anguish, diminished enjoyment of life, and the need for medical treatment, monitoring and/or medications. Despite the IARC’s classification of glyphosate as a class 2A probable carcinogen, Defendants continue to maintain that glyphosate and/or Roundup is safe, non-carcinogenic, nongenotoxic, and falsely warrant to users and the general public that independent experts and regulatory. agencies agree that there is no evidence of carcinogenicity or genotoxicity in glyphosate and Roundup. Defendants have claimed and continue to claim that Roundup is safe, non-carcinogenic, and non-genotoxic. Monsanto claims on its website that “[r]egulatory authorities and independent experts around the world have reviewed numerous long-term/carcinogenicity and genotoxicity studies and agree that there is no evidence that glyphosate, the active ingredient in Roundup brand herbicides and other glyphosate-based herbicides, causes cancer, even at very high doses, and that it is not genotoxic”. Ironically, the primary source for this statement is a 1986 report by the WHO, the same organization that now considers glyphosate to be a probable carcinogen. Glyphosate, and Defendants’ Roundup products in particular, have long been associated with serious side effects and many regulatory agencies around the globe have banned or are currently banning the use of glyphosate herbicide products. Defendants’ statements proclaiming the safety of Roundup and disregarding its dangers misled Plaintiff. Defendants’ failure to adequately warn Plaintiff resulted in (1) Plaintiff using and being exposed to glyphosate instead of using another acceptable and safe method of controlling unwanted weeds and pests; and (2) scientists and physicians failing to warn and instruct consumers about the risk of cancer, including NHL, and other injuries associated with Roundup. Defendants failed to seek modification of the labeling of Roundup to include relevant information regarding the risks and dangers associated with Roundup exposure. The failure of Defendants to appropriately warn and inform the EPA has resulted in inadequate warnings in safety information presented directly to users and consumers. The failure of Defendants to appropriately warn and inform the EPA has resulted in the absence of warning or caution statements that are adequate to protect health and the environment. The failure of Defendants to appropriately warn and inform the EPA has resulted in the directions for use that are not adequate to protect health and the environment. By reason of the foregoing acts and omissions, Plaintiff seeks compensatory damages as a result of Plaintiff’s use of, and exposure to, Roundup which caused or was a substantial contributing factor in causing Plaintiff to suffer from cancer, specifically NHL, and Plaintiff suffered severe and personal injuries which are permanent and lasting in nature, physical pain and mental anguish, including diminished enjoyment of life. By reason of the foregoing, Plaintiff is severely and permanently injured. By reason of the foregoing acts and omissions, Plaintiff has endured and, in some categories continues to suffer, emotional and mental anguish, medical expenses, and other economic and non-economic damages, as a result of the actions and inactions of the Defendants. Plaintiff used Roundup beginning in the 1980’s to control poison oak and weeds on his property. For many years, Plaintiff sprayed Roundup on a regular basis. Plaintiff followed all safety and precautionary warnings during the course of use. Plaintiff was subsequently diagnosed with large B-cell Non-Hodgkin Lymphoma [NHL] in February of 2015. As a result of his injury, Plaintiff has incurred significant economic and non-economic damages. Plaintiff incorporates by reference all prior paragraphs of this Complaint as if fully set forth herein. As a result of Defendants’ actions, Plaintiff was unaware, and could not reasonably know or have learned through reasonable diligence that Roundup and/or glyphosate contact, exposed Plaintiff to the risks alleged herein and that those risks were the direct and proximate result of Defendants’ acts and omissions. Furthermore, Defendants are estopped from relying on any statute of limitations because of their fraudulent concealment of the true character, quality and nature of Roundup. Defendants were under a duty to disclose the true character, quality, and nature of Roundup because this was non-public information over which Defendants had and continue to have exclusive control, and because Defendants knew that this information was not available to Plaintiff or to distributors of Roundup. In addition, Defendants are estopped from relying on any statute of limitations because of their intentional concealment of these facts. Plaintiff had no knowledge that Defendants were engaged in the wrongdoing alleged herein. Because of the fraudulent acts of concealment of wrongdoing by Defendants, Plaintiff could not have reasonably discovered the wrongdoing at any time prior. Also, the economics of this fraud should be considered. Defendants had the ability to and did spend enormous amounts of money in furtherance of their purpose of marketing, promoting and/or distributing a profitable herbicide, notwithstanding the known or reasonably known risks. Plaintiff and medical professionals could not have afforded and could not have possibly conducted studies to determine the nature, extent, and identity of related health risks, and were forced to rely on only the Defendants’ representations. Accordingly, Defendants are precluded by the discovery rule and/or the doctrine of fraudulent concealment from relying upon any statute of limitations. Plaintiff repeats, reiterates, and re-alleges each and every allegation of this Complaint contained in each of the foregoing paragraphs inclusive, with the same force and effect as if more fully set forth herein. Defendants had a duty to exercise reasonable care in the designing, researching, testing, manufacturing, marketing, supplying, promoting, packaging, sale, and/or distribution of Roundup into the stream of commerce, including a duty to assure that the product would not cause users to suffer unreasonable, dangerous side effects. Defendants failed to exercise ordinary care in the designing, researching, testing, manufacturing, marketing, supplying, promoting, packaging, sale, testing, quality assurance, quality control, and/or distribution of Roundup into interstate commerce in that Defendants knew or should have known that using Roundup created a high risk of unreasonable, dangerous side effects, including, but not limited to, the development of NHL, as well as other severe and personal injuries which are permanent and lasting in nature, physical pain and mental anguish, including diminished enjoyment of life, as well as need for lifelong medical treatment, monitoring, and/or medications. Improperly concealing and/or misrepresenting information from the Plaintiff, scientific and medical professionals, and/or the EPA, concerning the severity of risks and dangers of Roundup compared to other forms of herbicides. Negligently selling Roundup with a false and misleading label. Defendants under-reported, underestimated, and downplayed the serious dangers of Roundup. Defendants negligently and deceptively compared the safety risks and/or dangers of Roundup with common everyday foods such as table salt, and other forms of herbicides. Were otherwise careless and/or negligent. Despite the fact that Defendants knew or should have known that Roundup caused, or could cause, unreasonably dangerous side effects, Defendants continued and continue to market, manufacture, distribute, and/or sell Roundup to consumers, including the Plaintiff. Defendants knew or should have known that consumers such as the Plaintiff would foreseeably suffer injury as a result of Defendants’ failure to exercise ordinary care, as set forth above. Defendants’ violations of law and/or negligence were the proximate cause of Plaintiff’s injuries, harm and economic loss, which Plaintiff suffered and/or will continue to suffer. As a result of the foregoing acts and omissions, the Plaintiff suffered from serious and dangerous side effects including, but not limited to, NHL, as well as other severe and personal injuries which are permanent and lasting in nature, physical pain and mental anguish, diminished enjoyment of life, and financial expenses for hospitalization and medical care. Further, Plaintiff suffered life threatening NHL, and severe personal injuries, which are permanent and lasting in nature, physical pain and mental anguish, including diminished enjoyment of life. WHEREFORE, Plaintiff respectfully requests that this Court enter judgment in Plaintiff’s favor for compensatory and punitive damages, together with interest, costs herein incurred, attorneys’ fees and all relief as this Court deems just and proper. Additionally, Plaintiff demands a jury trial on all issues contained herein. Plaintiff repeats, reiterates and, re-alleges each and every allegation of this Complaint contained in each of the foregoing paragraphs inclusive, with the same force and effect as if more fully set forth herein. At all times herein mentioned, the Defendants designed, researched, manufactured, tested, advertised, promoted, sold, distributed, and/or have acquired the Defendants who have designed, researched, tested, advertised, promoted, marketed, sold, and distributed Roundup as hereinabove described that was used by the Plaintiff. Defendants’ Roundup was expected to and did reach the usual consumers, handlers, and persons coming into contact with said product without substantial change in the condition in which it was produced, manufactured, sold, distributed, and marketed by the Defendants. At those times, Roundup was in an unsafe, defective, and inherently dangerous condition, which was dangerous to users, and in particular, the Plaintiff herein. The Roundup designed, researched, manufactured, tested, advertised, promoted, marketed, sold, and distributed by Defendants was defective in design or formulation in that, when it left the hands of the manufacturer and/or suppliers, the foreseeable risks exceeded the benefits associated with the design or formulation of Roundup. The Roundup designed, researched, manufactured, tested, advertised, promoted, marketed, sold, and distributed by Defendants was defective in design and/or formulation, in that, when it left the hands of the Defendants manufacturers and/or suppliers, it was unreasonably dangerous, unreasonably dangerous in normal use, and it was more dangerous than an ordinary consumer would expect. When placed in the stream of commerce, Defendants’ Roundup Products were defective in design and formulation and, consequently, dangerous to an extent beyond that which an ordinary consumer would anticipate. When placed in the stream of commerce, Defendants’ Roundup products were unreasonably dangerous in that they were hazardous and posed a grave risk of cancer and other serious illnesses when used in a reasonably anticipated manner. When placed in the stream of commerce, Defendants’ Roundup products contained unreasonably dangerous design defects and were not reasonably safe when used in a reasonably anticipated manner. Defendants did not sufficiently test, investigate, or study its Roundup products. Exposure to Roundup presents a risk of harmful side effects that outweigh any potential utility stemming from the use of the herbicide. Defendants new or should have known at the time of marketing its Roundup products that exposure to Roundup and could result in cancer and other severe illnesses and injuries. Defendants did not conduct adequate post-marketing surveillance of its Roundup products. Defendants knew, or should have known that at all times herein mentioned its Roundup was in a defective condition, and was and is inherently dangerous and unsafe. Plaintiff was exposed to Defendants’ Roundup in the course of his employment, as described above, without knowledge of Roundup’s dangerous characteristics. At the time of the Plaintiff’s use of and exposure to Roundup, Roundup was being used for the purposes and in a manner normally intended, as a broad-spectrum herbicide. Defendants with this knowledge voluntarily designed its Roundup with a dangerous condition for use by the public, and in particular the Plaintiff. Defendants had a duty to create a product that was not unreasonably dangerous for its normal, intended use. Defendants created a product that was and is unreasonably dangerous for its normal, intended use. Defendants marketed and promoted a product in such a manner so as to make it inherently defective as the product downplayed its suspected, probable, and established health risks inherent with its normal, intended use. The Roundup designed, researched, manufactured, tested, advertised, promoted, marketed, sold, and distributed by Defendants was manufactured defectively in that Roundup left the hands of Defendants in a defective condition and was unreasonably dangerous to its intended users. 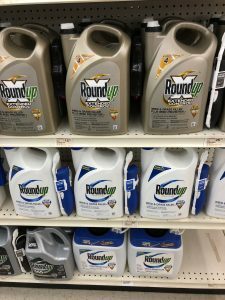 The Roundup designed, researched, manufactured, tested, advertised, promoted, marketed, sold, and distributed by Defendants reached their intended users in the same defective and unreasonably dangerous condition in which the Defendants’ Roundup was manufactured. Defendants designed, researched, manufactured, tested, advertised, promoted, marketed, sold, and distributed a defective product, which created an unreasonable risk to the health of consumers and to the Plaintiff in particular, and Defendants are therefore strictly liable for the injuries sustained by the Plaintiff. The Plaintiff could not, by the exercise of reasonable care, have discovered Roundup’s defects herein mentioned or perceived its danger. By reason of the foregoing, the Defendants have become strictly liable to the Plaintiff for the manufacturing, marketing, promoting, distribution, and selling of a defective product, Roundup. Defendants’ defective design, of Roundup amounts to willful, wanton, and/or reckless conduct by Defendants. Defects in Defendants’ Roundup were the cause or a substantial factor in causing Plaintiff’s injuries. As a result of the foregoing acts and omission, the Plaintiff developed NHL, and suffered severe and personal injuries, which are permanent and lasting in nature, physical pain and mental anguish, including diminished enjoyment of life, and financial expenses for hospitalization and medical care. Plaintiff repeats, reiterates and re-alleges each and every allegation of this Complaint contained in each of the foregoing paragraphs inclusive, with the same force and effect as if more fully set forth herein. Defendants have engaged in the business of selling, testing, distributing, supplying, manufacturing, marketing, and/or promoting Roundup, and through that conduct have knowingly and intentionally placed Roundup into the stream of commerce with full knowledge that it reaches consumers such as Plaintiff who are exposed to it through ordinary and reasonably foreseeable uses. Defendants did in fact sell, distribute, supply, manufacture, and/or promote Roundup to Plaintiff. Additionally, Defendants expected the Roundup that they were selling, distributing, supplying, manufacturing, and/or promoting to reach – and Roundup did in fact reach – consumers, including Plaintiff, without any substantial change in the condition of the product from when it was initially distributed by Defendants. At the time of manufacture, Defendant could have provided the warnings or instructions regarding the full and complete risks of Roundup and glyphosate-containing products because it knew or should have known of the unreasonable risks of harm associated with the use of and/or exposure to such products. At all times herein mentioned, the aforesaid product was defective and unsafe in manufacture such that it was unreasonably dangerous to the user, and was so at the time it was distributed by Defendants and at the time Plaintiff was exposed to and/or ingested the product. The defective condition of Roundup was due in part to the fact that it was not accompanied by proper warnings regarding its carcinogenic qualities and possible side effects, including, but not limited to, developing non-Hodgkin’s lymphoma as a result of exposure and use. Roundup did not contain a warning or caution statement, which was necessary and, if complied with, was adequate to protect health those exposed in violation of 7 U.S.C. § 136j(a)(1)(E). Defendants’ failure to include a warning or caution statement which was necessary and, if complied with, was adequate to protect the health of those exposed, violated 7 U.S.C. § 136j(a)(1)(E) as well as the laws of the State of California. Defendants could have amended the label of Roundup to provide additional warnings. This defect caused serious injury to Plaintiff, who used Roundup in its intended and foreseeable manner. At all times herein mentioned, Defendants had a duty to properly design, manufacture, compound, test, inspect, package, label, distribute, market, examine, maintain supply, provide proper warnings, and take such steps to assure that the product did not cause users to suffer from unreasonable and dangerous side effects. Defendants labeled, distributed, and promoted the aforesaid product that it was dangerous and unsafe for the use and purpose for which it was intended. Defendants failed to warn of the nature and scope of the side effects associated with Roundup, namely its carcinogenic properties and its propensity to cause or serve as a substantial contributing factor in the development of NHL. Defendants were aware of the probable consequences of the aforesaid conduct. Despite the fact that Defendants knew or should have known that Roundup caused serious injuries, Defendants failed to exercise reasonable care to warn of the dangerous carcinogenic properties and side effect of developing NHL from Roundup exposure, even though these side effects were known or reasonably scientifically knowable at the time of distribution. Defendants willfully and deliberately failed to avoid the consequences associated with their failure to warn, and in doing so, Defendants acted with a conscious disregard for the safety of Plaintiff. At the time of exposure, Plaintiff could not have reasonably discovered any defect in Roundup prior through the exercise of reasonable care. Defendants, as the manufacturers and/or distributors of the subject product, are held to the level of knowledge of an expert in the field. Plaintiff reasonably relied upon the skill, superior knowledge, and judgment of Defendants. Had Defendants properly disclosed the risks associated with Roundup, Plaintiff would have avoided the risk of NHL by not using Roundup. The information that Defendants did provide or communicate failed to contain adequate warnings and precautions that would have enabled Plaintiff, and similarly situated individuals, to utilize the product safely and with adequate protection. Instead, Defendants disseminated information that was inaccurate, false, and misleading and which failed to communicate accurately or adequately the comparative severity, duration, and extent of the risk of injuries associated with use of and/or exposure to Roundup and glyphosate; continued to promote the efficacy of Roundup, even after it knew or should have known of the unreasonable risks from use or exposure; and concealed, downplayed, or otherwise suppressed, through aggressive marketing and promotion, any information or research about the risks and dangers of exposure to Roundup and glyphosate. To this day, Defendants have failed to adequately warn of the true risks of Plaintiff’s injuries associated with the use of and exposure to Roundup. As a result of their inadequate warnings, Defendants’ Roundup products were defective and unreasonably dangerous when they left the possession and/or control of Defendant, were distributed by Defendant, and used by Plaintiff. As a direct and proximate result of Defendants’ actions as alleged herein, and in such other ways to be later shown, the subject product caused Plaintiff to sustain injuries as herein alleged. Plaintiff repeats, reiterates, and re-alleges each and every allegation of this Complaint contained in each of the foregoing paragraphs inclusive, with the same force and effect all if more fully set forth herein. At all times herein mentioned, the Defendants manufactured, distributed, compounded, recommended, merchandized, advertised, promoted, and sold Roundup and/or have recently acquired the Defendants who have manufactured, compound portrayed, distributed, recommended, merchandized, advertised, promoted, and sold Roundup, as a broad spectrum herbicide. These actions were under the ultimate control and supervision of Defendants. At the time Defendants marketed, sold, and distributed Roundup for use by Plaintiff, Defendants knew of Roundup’s intended use and impliedly warranted the product to be or merchantable quality and safe and fit for this use. The Defendants impliedly represented and warranted to Plaintiff and users of Roundup, the agricultural community, and/or the EPA that Roundup was safe and of merchantable quality and fit for the ordinary purpose for which it was to be used. These representations and warranties were false, misleading, and inaccurate in that Roundup was unsafe, unreasonably dangerous, not of merchantable quality, and defective. 183. Plaintiff and/or the EPA did rely on said implied warranty of merchantability of fitness for particular use and purpose. Plaintiff reasonably relied upon the skill and judgment of Defendants as to whether Roundup was of merchantable quality and safe and fit for its intended use. Roundup was injected into the stream of commerce by the Defendants in a defective, unsafe, and inherently dangerous condition, and the products’ materials were expected to and did reach users, handlers, and persons coming into contact with said products without substantial change in the condition in which they were sold. The Defendants breached the aforesaid implied warranties, as their herbicide Roundup was not fit for its intended purposes and uses. As a result of the foregoing acts and omissions, Plaintiff suffered from NHL and Plaintiff suffered severe and personal injuries which are permanent and lasting in nature, physical pain and mental anguish, including diminished enjoyment of life, financial expenses for hospitalization and medical care, including medical expenses and other economic, and non-economic damages. Plaintiff hereby demands trial by jury as to all issues. POSTSCRIPT: Still reading? Thank you for sticking with this. We can’t imagine what it is like to be diagnosed with a serious cancer. If you or a loved one have cancer, however, and believe the cancer was caused by exposure to Roundup, you may have a case. To date, most of the scientific evidence has been focused on certain cancers such as multiple myeloma, non Hodgkin lymphoma and certain types of leukemia. We know of physicians, however, that link herbicide use to other cancers and diseases. Whether those links can yet be proven remains to be seen. We think Monsanto knows the answers but won’t tell the truth. Our focus is to put cases together from the inside out wherever possible. That is why we seek both Roundup cancer victims and Monsanto whistleblowers. Why whistleblowers? They have the inside scoop of where documents might be hidden, internal “smoking gun” emails and former employees who might have valuable information. or by phone at 202-800-9791. If you are a Monsanto insider, know that you can call anonymously or be assured that your conversation will be kept confidential if you so wish.